Mama mia, that’s a spicy meatball. That 1969 Alka Seltzer commercial is before my time…no, really, it is…but, that phrase popped right into my head when I popped a Buffalo Bleu Turkey Meatball into my mouth. 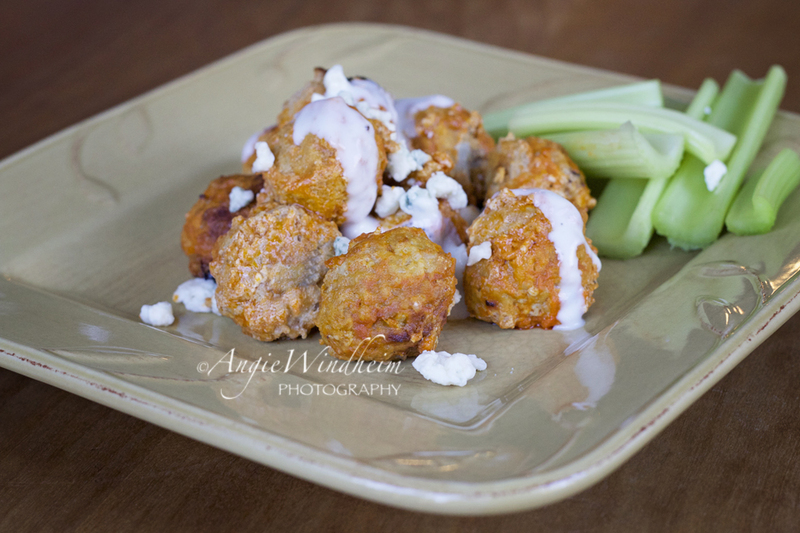 Buffalo Bleu Turkey Meatballs are s-s-spicy and oh-so-awesome. And, they are way less messy than a chicken wing on Super Bowl Sunday. No bones. No sauce on your cheek. No sticky fingers. If you follow my blog at all, you’ll notice that many of my “appetizers” are eaten at my house as a meal. No exception for Buffalo Bleu Turkey Meatballs. This was a recipe that my whole family happily enjoyed for dinner. Step 1: Move oven rack to approximately 6 inches below heating coils. Turn on oven to High Broil. Step 2: Lightly oil a rimmed baking sheet. I lightly brushed vegetable oil over the bottom portion of a broiler pan. Step3: Throughly combine all meatball ingredients in a large mixing bowl. I used my hands. Step 4: Shape meat mixture into 1 inch meatballs and place on the oiled baking sheet. Step 5: Broil meatballs for 7 minutes. Meanwhile, mix the basting sauce of melted butter and Frank’s together in small bowl. Step 6: Remove meatballs from oven, switch oven on to bake at 375°F. Generously brush basting sauce over each meatball. Use all of the sauce. Step 7: Bake meatballs for 20 minutes. Step 8: Remove meatballs from oven. Serve warm with bleu cheese crumbles, celery pieces and maybe a little bleu cheese dressing to help put out the fire.